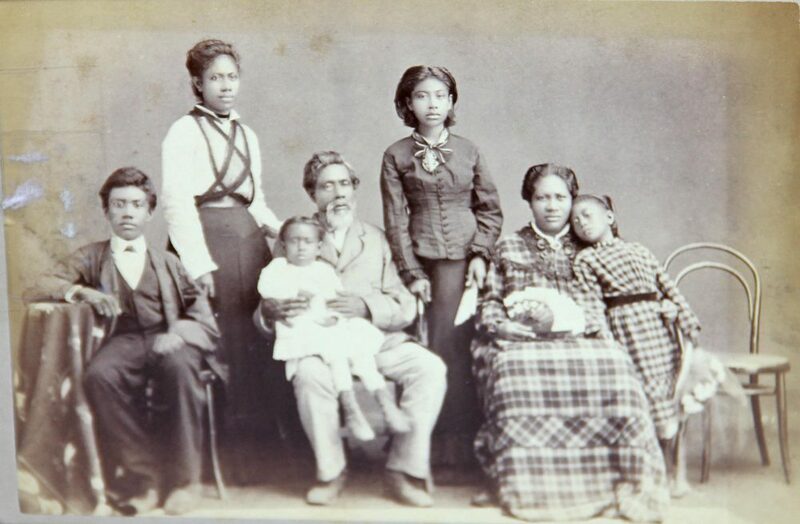 Native Hawaiian missionary family, 1878. Photo courtesy of Wikimedia Commons. I was 16 when I first visited the islands. A skinny, white girl with a bad perm, I became red as a lobster after spending one week on Maui. I wasn’t interested in the history of our 50th state at the time, yet on Oahu something important happened to me. Walking through shops and outdoor malls in downtown Honolulu, I saw for the first time a multiethnic society very different from my own Midwestern home. Up until that day my conception of America was of a place filled with people just like me. Hawaii changed me. I wanted to know its story, and I knew it would be different from my own. The long history of the Hawaiian people does not get much attention on the mainland of the United States. Most historical accounts begin after British Captain James Cook became the first European to explore the archipelago in 1778. The people Cook met in the islands had occupied the ’āina (land) for nearly 1500 years. By the 19th century, European and American explorers, merchants, and naval officers routinely disembarked on Hawaiian shores. Native Hawaiians welcomed them. For Hawaiians, the Pacific Ocean (ka moana) was part of their home, and the haole (foreigners) arriving on it were guests. In 1820, 14 American missionaries—seven married couples—arrived. They were New England Protestants hoping to influence the mysterious, pagan people of the islands. The missionaries had sold all their possessions and intended to stay for life. They had no intentions of returning to the United States. Other American missionary couples followed, and their children, born in the islands, multiplied. By the 1850s children of American missionaries numbered over 250. Calling themselves “Anglo-Hawaiians,” the white children roamed freely across the islands. They considered themselves loyal subjects of the indigenous Hawaiian monarchy, whose sovereignty and independence the United States, Britain, and France tacitly agreed to defend. But missionary parents worried that, in the islands, their children would not receive the benefits of American citizenship—such as education, apprenticeships, land, and wage employment. Missionary parents never considered their children anything other than American in citizenship, ethnicity, and social belonging. So the parents created an all-white boarding school in Honolulu—Punahou School—to prepare their children to enter colleges in the United States. Perhaps unsurprisingly, missionary children felt differently than their parents. Those that attended U.S. colleges wrote home to friends about their experiences. Americans, it seemed, did not consider the missionary children fully white. Darkly tanned, poorly dressed, and speaking a heathen tongue (in addition to English, Greek, and Latin), the missionary children were born in a tropical climate which, Americans believed, caused slothfulness and delayed industrial progress. Missionary children discovered that, in the United States, they were considered little better than Native Hawaiians. Many Americans regarded the white students from Hawaii as the missionaries regarded the indigenous people of the islands: morally suspect and racially subordinate. Almost without exception, the missionary children hated living in the United States. They did not belong in America. Hawaiian Girl Wearing Lei. Photo courtesy of Mission Houses Museum. Instead, missionary children returned to the islands to build their future atop the high status their parents enjoyed as spiritual and political advisors to the Hawaiian government. While teaching Hawaiian royalty the English language and international law, American missionaries also advised Hawaiian rulers on land division, agricultural production, and private property—all of which both the Hawaiian king and legislature (itself a missionary-inspired creation) saw as ways to be economically competitive and to survive the colonial impulses of Europeans and Americans. This overstates the missionaries’ acquired wealth and understates the missionary children’s goal of benefiting from their parents’ reputations. While the missionaries used their power to secure opportunities for their children to purchase land cheaply, missionary children returned to the islands as college graduates to gain wealth and access to government appointments and new professions, including law, surveying, engineering, and, of course, sugar planting. The power of these children would grow. As Hawaiian cultural traditions—such as communal taro planting—died out, so did Native Hawaiians, devastated by foreign diseases, including smallpox, measles, syphilis, and tuberculosis. 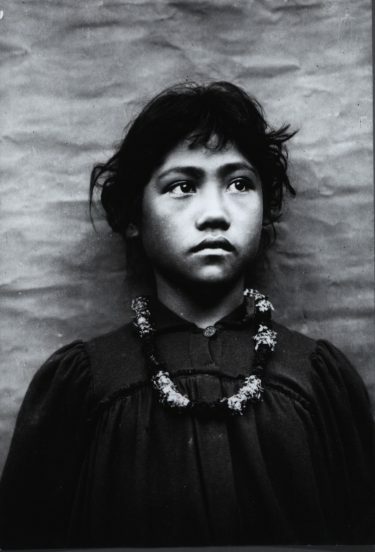 Between 1832 and 1853 the Native Hawaiian population dropped from 130,000 to 70,000. By 1900 that number had again been cut in half. Remaining natives watched their king and legislature divest government lands to arriving foreigners hoping to take advantage of economic growth. The era of the plantations had arrived. Sugar planters contracted laborers (little more than slaves) from Japan, China, South America, and Portugal to supplement the declining native population. Native Hawaiians were not ignorant of their declining position. In petitions to the king and in Hawaiian-language newspapers, Hawaiians begged their government not to sell land to foreigners. Missionary children initially stood outside this debate. They were Hawaiian subjects by their birth in the islands, not haole (foreigners), a word used to describe the white immigrants from the United States and Europe. Native Hawaiians eventually found a different epithet for the missionary children who supported the radical transformation of the islands. They simply called the children “missionary.” As American missionary parents aged, retired, returned to the United States, and even died, the term was clearly meant for the children who had not chosen to follow their parents into ministry yet remained in the islands to benefit from their parents’ success. Many Americans regarded the white students from Hawaii as the missionaries regarded the indigenous people of the islands: morally suspect and racially subordinate. The insults did not stop the changes. Nor did attempts by successive Hawaiian kings in the 1860s, 1870s, and 1880s to bridle “missionary” influence. In the 1890s, adult missionary children decided that U.S. citizenship was the only means to protect their political status in the islands. They also desired to cement Hawaii’s close trade partnership with the United States. When Queen Liliʻuokalani attempted to abrogate the constitution in order to strengthen her own power and increase the political rights of indigenous Hawaiians, the missionary children violently reacted. In 1893 a group led by Sanford Ballard Dole, Hawaiian-born son of American missionaries, overthrew the queen. The group established a republic that tied voting rights to wealth and land ownership, effectively giving Anglo-Hawaiians and haole absolute political control. In 1898 the U.S. Congress granted this group’s wishes and annexed the islands. Annexation gave Native Hawaiians American citizenship under the protections of the 14th Amendment of the U.S. Constitution. But Native Hawaiians did not want the citizenship. Those who witnessed the raising of the U.S. flag above ‘Iolani Palace—the U.S. territorial statehouse which had once been the home of the queen—wept. Both Native Hawaiians and missionary children won—and lost—from this transition. The missionary children gained the economic benefits accompanying U.S. citizenship—but lost their social belonging among the Hawaiian people. Native Hawaiians gained an American identity and citizenship—but lost their land, language, government, and culture. Who wouldn’t want to be an American? In the heart of the Midwest, where I grew up, it is a rhetorical question. If pressed, the answer is usually circular. The freedom and prosperity we enjoy as Americans is because we are Americans. Yet the Hawaiian people lost much in becoming part of our nation. Some Native Hawaiians today argue for the return of national sovereignty. In 2016 the last sugar plantation closed, and young Hawaiians now seek to revive the traditional, communal taro planting on its fallow grounds. The Hawaiian state government is leading an initiative to grow more food and reduce the state’s dependency on costly imports. Hawaiian scholars and their students have resurrected the Hawaiian language. While such efforts are historically and economically vital, Hawaiian residents—of all ethnicities—also take pride in another narrative: Hawaii is the first U.S. state in which there is no ethnic majority. When I first visited the islands 25 years ago, I walked among Asian Americans—now the largest ethnic group living in the islands—as well as Hawaiian Americans, white Americans, and visitors from all over the world. And, just as in the 19th century, Hawaii’s residents, the maka‘āinana (“people who work the land”), welcomed me. Some argue that Hawaii’s tourist industry furthers a false narrative about the history of the islands, but I don’t see it that way. To welcome others to one’s home, to treat someone well—regardless of wealth, status, ethnicity, color, or the costs of such hospitality—is truly Hawaiian. Despite the devastating losses to their population and culture, Native Hawaiians today continue to show hospitality and generosity to their fellow island residents and to those who continually visit their shores. They provide a living example of how to be an American. Joy Schulz is a member of the history faculty at Metropolitan Community College in Omaha, Nebraska. You can read more about Hawaii’s early history in her book Hawaiian by Birth: Missionary Children, Bicultural Identity, and U.S. Colonialism in the Pacific (University of Nebraska Press, 2017). This essay is part of an ongoing series, produced by the Daniel K. Inouye Institute and Zócalo Public Square, exploring Hawai‘i's past, present, and future. Primary Editor: Joe Mathews | Secondary Editor: Lisa Margonelli.